The lovely Beca, owner and creator behind The Shrubbery, was way into the idea of coming over for a cocktail tutorial afternoon. Mixed drinks are not my area of expertise, so I was really amped to get some education on the subject. 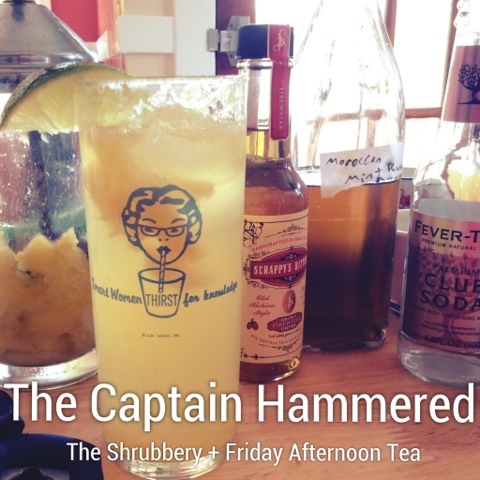 I infused the booze, picked up some assorted citrus at the store and eagerly awaited the arrival of my dear friend. 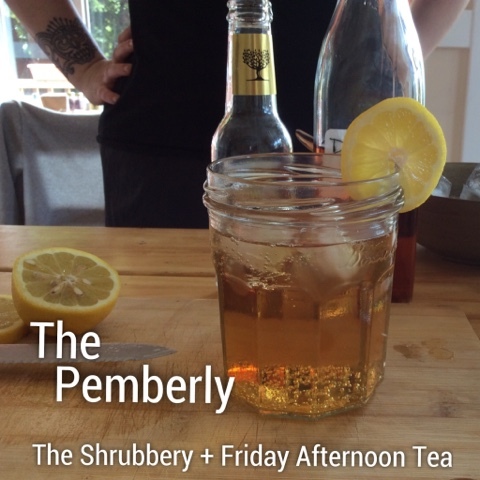 Ok, at this point I'm going to hit pause on the story of a delightful afternoon for those of you who don't know how to infuse spirits with tea. It's seriously easy, instantly makes cocktail hour more interesting and will absolutely make you seem way fancier than you maybe actually are. 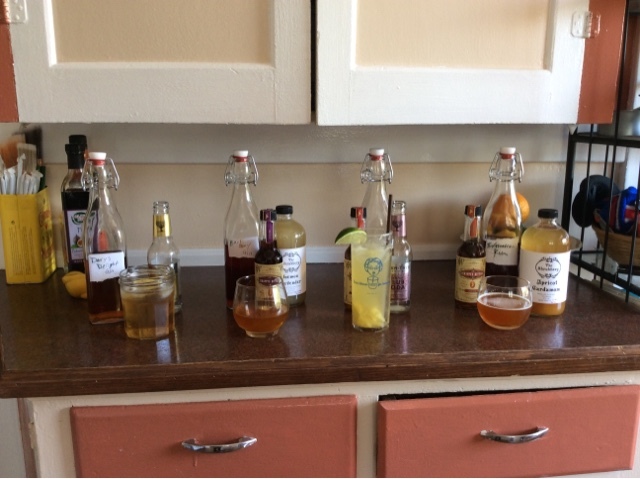 All you need to do is take any spirit, find a tea or tea blend with a complementing palate and infuse away! I use one tablespoon of any given leaf in a pint of whatever spirit I've paired it with, let it sit for about 12 hours and then strain the leaves out. Now we can make some fancypants tea cocktails! So Beca showed up to my place with this amazing weird fur suitcase that strongly reminded me of the Monster Book of Monsters in Harry Potter. It turned out to be a fun little portable bar setup with a jogger and shaker and strainer and some bitters and some of her fabulous shrub. As previously stated, I don't really know a lot about inventing fun cocktails. Fortunately, Beca is a friggin pro and whipped up some super tasty concoctions like it was NBD. In a glass with ice, just go ahead and throw in 2 oz. of gin infused with Darcy's Delight. Stir a touch, then top with 3-4 oz. tonic water and garnish with lemon. Shake 1.5 oz. 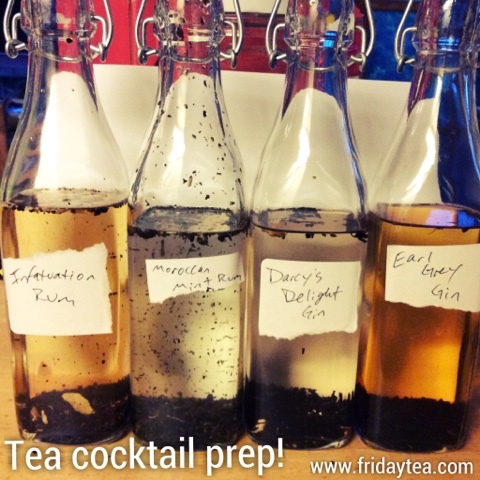 Earl Grey-infused gin, 1/2-3/4 oz. Lemon Lavender shrub and 3-4 dashes of Orleans bitters until well chilled. Strain into a glass with one ice cube, garnish with orange peel. Smash the bajeebus out of 1/2 cup pineapple tidbits, 1/2 lime, 2 oz. Moroccan Mint white rum, 3-6 dashes of Firewater bitters (depending on spice tolerance/enjoyment). Strain over ice, top with 3-4 oz. club soda. Garnish with lime slice and booze-soaked pineapple. In a shaker with ice, combine 3/4 oz. 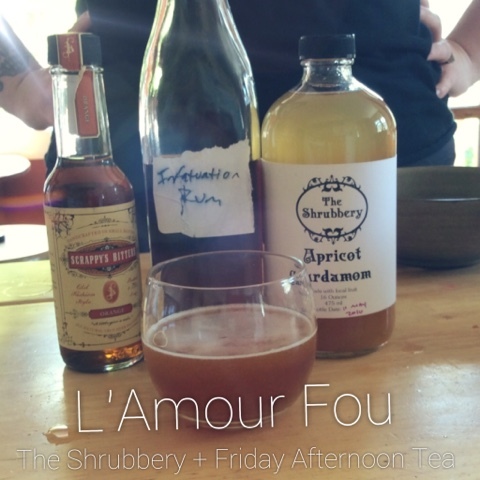 Apricot Cardamom shrub, 2 oz. Infatuation Blend-infused white rum, 3-4 dashes of orange bitters. Shake until hella chill, then strain into a glass. So there you have it! 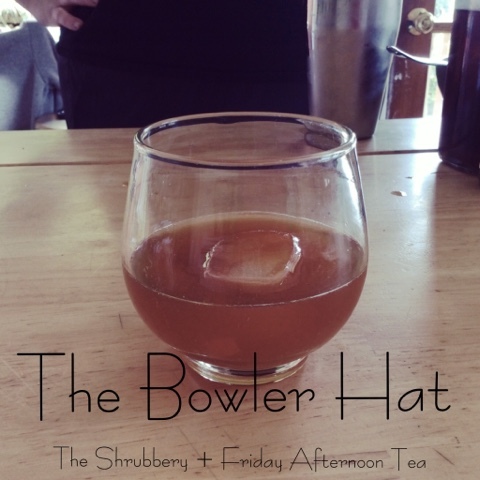 Any ideas for other tea-based cocktails you'd like to see? Any you've made that you'd like to share? Any of these you're planning to try yourself? Let us know!